One issue I had, though, was that these boxes were pretty expensive. We have boxes in Australia that go all the way up to AUD39.99 per month, and I find that pretty damn scary. Plus, most of the time, you don't get to customise your box very much, and you don't get to decide to forgo your subscription for the month unless you do it before you find out what products are coming. My first impression of the box was that it was very beautifully packaged. I love old-school, recycled paper, and this box was just that - old paper packaging with laid-back typewriter print. I received the Blogger's Kit, which is slightly different from a regular box in that it contains more items for us to sample and blog about. Overall though, I am very impressed with the brands on offer, as well as the range of products to try. What was in my kit? If I'm being perfectly honest with you, I haven't opened 2 out of the 3 samples I received, because (another perk of beauty boxes that I absolutely love!) they are so perfect for travelling! I have tried the Almond Blossom Body Lotion, though, and it is very impressive. I don't trust brands I haven't heard of or tried, but I will try them, albeit a little warily. I didn't expect to, but I fell in love with this body lotion because it melted into my skin immediately upon application. This is some serious stuff - NO GREASINESS AT ALL! Kudos to Modbox for unearthing a quality brand to introduce to their customers! Murad is a well-known, well-trusted skincare brand, and the next item in my kit. The Resurgence Hydrating Toner was a little strongly scented (a lot of smells give me a headache and this was one of them) but thankfully, the smell disappeared after a few minutes. This toner was instantly hydrating on the skin, which I loved. I am also very impressed that Modbox managed to pop in a skincare product (I should say duo! This pack contains 2 skincare products) containing active ingredients into the mix! Active ingredients are slightly more harsh but more effective on the skin, removing dead skin cells and promoting regrowth, which in turn gives you younger, more radiant looking skin. These products by dermedex are formulated to cleanse the skin and clear acne and blackheads. YES, more and more brands are becoming more aware of female hair loss, and are doing something about it! Human Nature is all natural and SLS-free - which means it is more gentle on your scalp and better for your health overall. It contains ingredients that help to rebuild the hair, as well as retain moisture. A big thank you to Modbox for acknowledging this problem, and for including a product that might help us deal with it! This shampoo will be reviewed in my anti-hair loss post, coming soon. Another well-thought-out addition to this box is this vegan-friendly hand cream. It doesn't sink into the skin quite as quickly as the Kneipps body lotion, but does the trick all the same. No greasiness, and that's the most important thing! All in all, I am very immensely impressed with the product range on offer by Modbox. I love that their items are sourced from more hard-to-find brands, and that they range from active ingredients to gentle, SLS and paraben free products as well. I also love the concept, where you get to pick your three products first each month, from a range of categories, without having to commit to something you might not like at all. What's more, each box is only a breezy RM 9 with a cheap RM 6 postage fee to West Malaysia (postage costs RM 9 to East Malaysia). 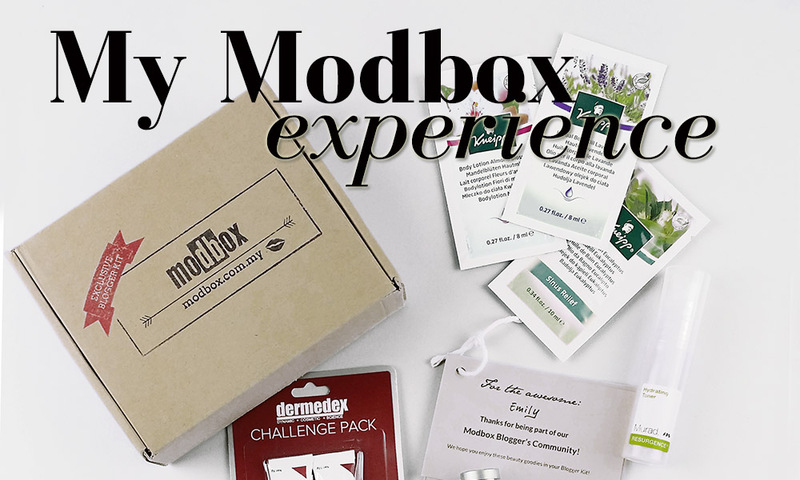 As with a lot of other beauty boxes, Modbox also offers full-sized versions of the products and brands available in their boxes for purchase on their website, at www.modbox.com.my/modshop. What's great about this is that you get access to all these brands, which we know can be really difficult to find and get a hold of here in Malaysia.